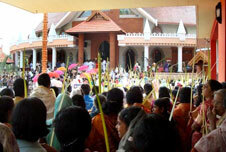 The liturgical year of the Syro-Malabar Church begins with the period of Annunciation. The four weeks in preparation to the feast of the Nativity of Jesus, celebrated on 25th December constitute this season. Palm Sunday (Oshana njayar) is celebrated in preparation to the great week of Jesus’ suffering, death, and resurrection for the salvation of the humankind. Denha was considered in ancient Christianity as the second great feast after Easter. The Baptism and the Birth of Jesus were celebrated together until Constantine declared Dec. 25 as Christmas. Wish you all a Blessed Christmas and a Grace filled New Year! "They were all filled with the Holy Spirit and began to speak in other tongues"